WILLEMSTAD - The Netherlands and Curacao must become big friends again. Eugene Rhuggenaath, who is likely to take over as Prime Minister, wants to strengthen the relationship with the Netherlands, especially after the period where anti-Dutch parties were in power. “If we do not get that chance, then when?” Says Rhuggenaath in an interview with a Dutch newspaper. Rhuggenaath led the Liberal Party PAR Friday to a clear election victory. Gerrit Shotte, who was convicted of corruption last year, and who preached independence with his political party MFK, ended only as third. “The people have chosen for tranquility and integrity in government. Electors were tired of everything that was taking place in politics. They simply wanted a government that serves and functions,” says the PAR leader. After Curaçao became an autonomous country in the Dutch Kingdom in 2010, the island ended up in a political roller coaster with its first Prime Minister, Gerrit Schotte. Public finances were looted and the people set up against each other. Six weeks ago, Schotte tried to frustrate the elections. That was "in fact a coup", acknowledged Minister Plasterk (Kingdom Relationships) recently in a televised interview. Rhuggenaath: "It is time to invest in a new relationship with the Netherlands." In his view, that never happened after the Netherlands Antilles was dismantled in 2010. "Now we have a direct relationship, but Curaçao has never come to deepen that new collaboration." Trade and commerce offer opportunities. "But we must also look at what we can do in health care and education." School dropout is one of the causes of high-level crime on the island. Curaçao as a transit country for South American drugs and the collapse of neighboring Venezuela is still worsening. Rhuggenaath: "In all neighborhoods on the island, you hear that safety is a major concern. We need to see if we can improve the intelligence (information collection on criminal activities) together. " The 47-year-old politician, who studied in Miami and Rotterdam, also hopes to end the division among the people on the island. "We have to unite. Goals like education and safety are not reserved for one party. We must do that together. I believe in serving leadership. "At the same time, after many tumults, he sees that there is little confidence in politics. "Maybe there are lessons to be learned from other places in the Kingdom." PAR will form a government with MAN and the new party PIN. 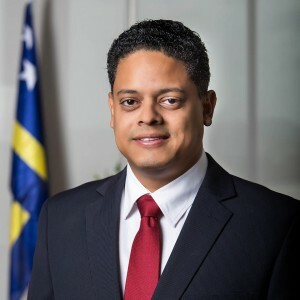 Rhuggenaath will be the new Prime Minister of Curaçao.